Name Variation Margaret Kensler was also known as Kynstler. Name Variation Margaret Kensler was also known as Margret. Married Name circa 1861 As of circa 1861,her married name was Brandt. Margaret Kensler was born on 17 June 1842 at Prussia. She married Christopher Brandt, son of Barthel Joseph Brandt and Margaretha Palmer, circa 1861. 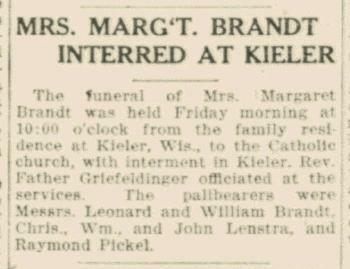 Margaret Kensler was buried in November 1907 at Immaculate Conception Catholic Church Cemetery, Kieler, Grant, Wisconsin, Margaret (Kensler) Brandt funeral notice. 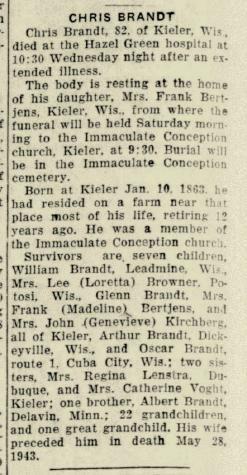 She died on 7 November 1917 at Kieler, Grant, Wisconsin, at age 75 Margaret (Kensler) Brandt obituary. She was buried after 7 November 1917 at Immaculate Conception Church Cemetery, Kieler, Grant, Wisconsin. Margaret Kensler had 6 with 6 living in 1900 children. She had 8 with 6 living in 1910 children. Name Variation Christian Brandt was also known as Chris. Name Variation Christian Brandt was also known as Christopher. Christian Brandt was born on 10 January 1863 at Kieler, Grant, Wisconsin, also reported as 1862. He was the son of Christopher Brandt and Margaret Kensler. Christian Brandt married Mary S. Winchel circa 1895. Christian Brandt was buried in October 1945 at Immaculate Conception Church Cemetery, Kieler, Grant, Wisconsin. He died in October 1945 at Hazel Green, Grant, Wisconsin, at age 82 Chris Brandt obituary. Married Name Her married name was (?) Lenstra. Name Variation Ragina Brandt was also known as Jennie. Name Variation Ragina Brandt was also known as Regena. Ragina Brandt married John Wilbert Lenstra. Ragina Brandt was born in 1864 at Kieler, Grant, Wisconsin. She was the daughter of Christopher Brandt and Margaret Kensler. Ragina Brandt died in 1952 at Kieler, Grant, Wisconsin. Albert Brandt was born circa 1869 at Wisconsin. Albert Brandt died before 1876. Married Name 21 November 1894 As of 21 November 1894,her married name was Pickel. Anna N. Brandt was born on 20 December 1870 at Jamestown, Grant, Wisconsin, also reported as 20 Dec 1869. 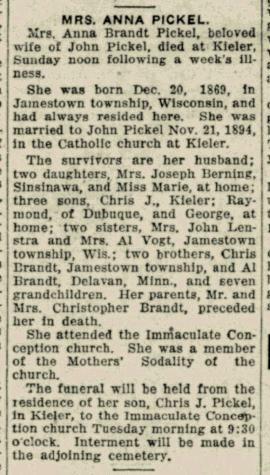 Anna N. Brandt married John Pickel on 21 November 1894 at Kieler, Grant, Wisconsin. Anna N. Brandt died on 8 November 1931 at Kieler, Grant, Wisconsin, at age 60 Anna (Brandt) Pickel obituary. Joseph Brandt was born in March 1872 at Wisconsin. Joseph Brandt died before 1917. Married Name Her married name was Vogt. Name Variation Kathryn Brandt was also known as Catharine. Name Variation Kathryn Brandt was also known as Catherine Voght. Name Variation Kathryn Brandt was also known as Kate. Name Variation Kathryn Brandt was also known as Katherine. Kathryn Brandt married Albert Valentine Vogt. Kathryn Brandt was born in January 1879. 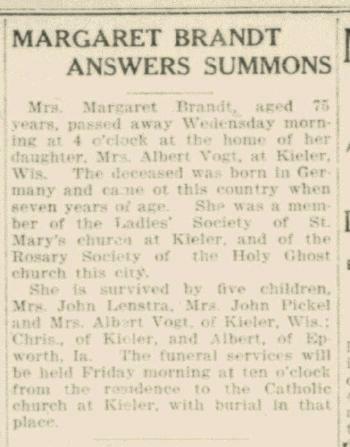 Kathryn Brandt witnessed the death of Margaret Kensler on 7 November 1917 at Kieler, Grant, Wisconsin; Margaret (Kensler) Brandt obituary. Kathryn Brandt was buried in 1955 at Immaculate Conception Church Cemetery, Kieler, Grant, Wisconsin. Married Name before 1925 As of before 1925,her married name was Brandt. Lulu Broderick was born circa 1903 at Iowa. She was the daughter of Thomas Broderick and Sophia Robey. Lulu Broderick married Gregory R. Brandt, son of Clemens Brandt and Anna Barbara Wilhelmina Bischoff, before 1925. Thomas Broderick married Sophia Robey. Thomas Broderick died before 1925. Married Name Her married name was Broderick. Sophia Robey married Thomas Broderick. Sophia Robey was born circa 1882 at Germany. Married Name before 1921 As of before 1921,her married name was Brandt. Mary Rooney was born circa 1891 at Iowa. She was the daughter of J. C. Rooney and Margaret McAughey. Mary Rooney married George Brandt, son of Clemens Brandt and Anna Barbara Wilhelmina Bischoff, before 1921. Vincent Brandt was born circa 1921 at Iowa. He was the son of George Brandt and Mary Rooney. J. C. Rooney married Margaret McAughey. J. C. Rooney was born circa 1865 at Ireland. Married Name Her married name was Rooney. Margaret McAughey married J. C. Rooney. Margaret McAughey was born circa 1875 at Wisconsin. Married Name before 1920 As of before 1920,her married name was Brandt. Lillian Plein was born circa 1899 at Illinois. She was the daughter of John Plein and Anna Meyer. Lillian Plein married Justin Brandt, son of Clemens Brandt and Anna Barbara Wilhelmina Bischoff, before 1920. Elmer J. Brandt was born circa 1920 at Iowa. He was the son of Justin Brandt and Lillian Plein. Corrinne L. Brandt was born circa 1921 at Iowa. She was the daughter of Justin Brandt and Lillian Plein. John Plein married Anna Meyer. John Plein was born circa 1864 at Iowa. Married Name Her married name was Plein. Anna Meyer married John Plein. Anna Meyer was born circa 1863 at Germany. Josephine Brandt was born circa 1856 at Wisconsin. She was the daughter of Andrew Joseph Brandt and Victoria Witherholt. [S248] U.S. Federal Census 1860 U.S. Federal Census, by Ancestry.com, Year: 1860; Census Place: Jamestown, Grant, Wisconsin; Roll: M653_1409; Page: 323; Image: 331; Family History Library Film: 805409. [S247] U.S. Federal Census 1870 U.S. Federal Census, by Ancestry.com, Year: 1870; Census Place: Jamestown, Grant, Wisconsin; Roll: M593_1717; Page: 216B; Image: 39; Family History Library Film: 553216. Edward Brandt was born circa April 1860 at Wisconsin. He was the son of Andrew Joseph Brandt and Victoria Witherholt. Valentine Brandt was born in October 1869 at Wisconsin. Harold F Pollock Sr. married Lois E. Brandt, daughter of William C. Brandt and Josephine C. Richard. Harold F Pollock Sr. was born on 9 May 1920 at Iowa. He died on 6 June 1993 at Iowa at age 73. Name Variation William Haas was also known as Wilhelm. William Haas was born on 4 October 1861 at Wisconsin also reported as Jan 1861. He was the son of Frank Haase and unknown (?). William Haas married Teresa Klaus, daughter of Joseph Klaus and Dorethea Theresa Kieler, in 1885. William Haas died on 23 September 1929 at Dubuque, Iowa, at age 67 William Haas, 68, of Lincoln Avenue in Dubuque, Iowa, was claimed by death at the Mercy hospital in Dubuque Monday morning, September 23, at 3:30 o'clock. Death was due to blood poisoning caused by a splinter which penetrated his hand a week ago while he was at work at the Brunswick factory. Rev. Father A.A. Boeding, pastor, read a mass of requiem in Sacred Heart Church in Dubuque Wednesday morning, September 25, at 9 o'clock. The remains were interred in Mount Calvary Cemetery in Dubuque. Pallbearers were nephews of the deceased, Henry and Joseph Richard, Edward Haas, George Vosberg, Frank Weber, and John Ludwig. Mr. Haas was survived by his wife, Theresa; three daughters, Miss Dora Haas, Mesdames William Pust, and Mrs. Moral Lehman, all of Dubuque, Ia; two sons, Frederick and Joseph, both of Dubuque, Ia; thirteen grandchildren; five sisters, Mesdames Henry Weber and Joseph Brandt, of Kieler, Wis., Mrs. L. Elmer, of Dubuque, Ia., Mrs. M. Connoly, of Montana, and Mrs. B. Berning, of Hazel Green, Wis., and seven brothers, Fred, of Pierce, Neb., Frank, of Potosi, Wis., Lawrence and Charles, of Hazel Green, Wis., Anton, of Dubuque, Ia., Adam, of Kieler, Wis., and Joseph, of Minnesota. He was buried after 23 September 1929 at Mount Calvary Cemetery, Dubuque, Dubuque, Iowa. [S245] U.S. Federal Census 1900 U.S. Federal Census, by Ancestry.com, Year: 1900; Census Place: Julien, Dubuque, Iowa; Roll: 430; Page: 13A; Enumeration District: 0114; FHL microfilm: 1240430. [S244] U.S. Federal Census 1910 U.S. Federal Census, by Ancestry.com, Year: 1910; Census Place: Dubuque Ward 5, Dubuque, Iowa; Roll: T624_402; Page: 11A; Enumeration District: 0132; ; FHL microfilm: 1374415. [S243] U.S. Federal Census 1920 U.S. Federal Census, by Ancestry.com, Year: 1920; Census Place: Dubuque Ward 5, Dubuque, Iowa; Roll: T625_488; Page: 7B; Enumeration District: 147; Image: 746. Dorothea Margarette Haas was born on 10 July 1886 at Wisconsin. She was the daughter of William Haas and Teresa Klaus. Dorothea Margarette Haas died on 30 November 1943 at age 57. She was buried after 30 November 1943 at Mount Calvary Cemetery, Dubuque, Dubuque, Iowa. 1 January 1925 Dubuque, Dubuque, Iowa Dorothea Margarette Haas appeared on the census of 1 January 1925 in the household of William Haas at Dubuque, Dubuque, Iowa. Married Name before 1923 As of before 1923,her married name was Pust. Gertrude Matilda Haas was born on 31 October 1887 at Wisconsin. Gertrude Matilda Haas married William Pust, son of Aug Pust and Caroline Fetachela, before 1923. Gertrude Matilda Haas was buried in 1976 at Linwood Cemetery, Dubuque, Dubuque, Iowa. 1 January 1925 Dubuque, Dubuque, Iowa Gertrude Matilda Haas appeared on the census of 1 January 1925 in the household of William Pust at Dubuque, Dubuque, Iowa. Name Variation Fred Albert Haas was also known as Albert Frederick. Fred Albert Haas was born on 9 February 1889 at Nebraska. He was the son of William Haas and Teresa Klaus. Fred Albert Haas married Laura Elenbolt, daughter of Henry Elenbolt and Martha Russow, in 1914. Fred Albert Haas died on 9 January 1967 at Dubuque, Iowa, at age 77 Fred Albert Haas obituary. He was buried after 9 January 1967 at Mount Calvary Cemetery, Dubuque, Dubuque, Iowa. 1 January 1925 Dubuque, Dubuque, Iowa Fred Albert Haas appeared on the census of 1 January 1925 at Dubuque, Dubuque, Iowa. Joseph Frank Haas was born on 22 February 1894 at Wayne, Nebraska. Joseph Frank Haas married Lillian E. Berie, daughter of Peter Berie and Anna Hamlin, on 3 January 1918 at Dubuque, Iowa. Joseph Frank Haas was buried in 1946 at Mount Calvary Cemetery, Dubuque, Dubuque, Iowa. 1 January 1925 Dubuque, Dubuque, Iowa Joseph Frank Haas appeared on the census of 1 January 1925 at Dubuque, Dubuque, Iowa. Name Variation Loretta Elizabetha Haas was also known as Lauretta Elizabetha. Married Name Her married name was Lehman. Loretta Elizabetha Haas married Moral Lehman, son of John Lehman and Pauline Sanner. Loretta Elizabetha Haas was born on 1 July 1899 at Iowa. Loretta Elizabetha Haas died on 23 May 1974 at age 74. She was buried after 23 May 1974 at Mount Calvary Cemetery, Dubuque, Dubuque, Iowa. 1 January 1925 Dubuque, Dubuque, Iowa Loretta Elizabetha Haas appeared on the census of 1 January 1925 in the household of Moral Lehman at Dubuque, Dubuque, Iowa. Moral Lehman married Loretta Elizabetha Haas, daughter of William Haas and Teresa Klaus. Moral Lehman was born on 2 August 1898 at Iowa. He was the son of John Lehman and Pauline Sanner. Moral Lehman died in November 1979 at age 81. 1 January 1925 Dubuque, Dubuque, Iowa Moral Lehman appeared on the census of 1 January 1925 at Dubuque, Dubuque, Iowa.